From their very first breath, our children are exposed to noise. Some noise is safe but some (and you’ll be surprised by what) can be quite damaging and once the damage is done, there’s no reversing it. Em’s 4 Kids have a great way to enjoy noisy activities without any damage! Em’s 4 Kids are the first in the world with hearing protection earmuffs for babies, known as Em’s 4 Bubs. This is such a fantastic design – the earmuffs sit on a soft elastic headband so there’s nothing hard against fragile little heads. There are three cute designs so you can pick one to suit your baby’s personality. I always associated hearing loss with noises such as super-loud music, fireworks, racing cars, that kind of thing. It never crossed my mind that the lawn mower might damage my children’s ears. Em’s 4 Kids have useful information on children’s hearing which is definitely worth reading. Like me, you might be quite surprised by what can actually harm your child. 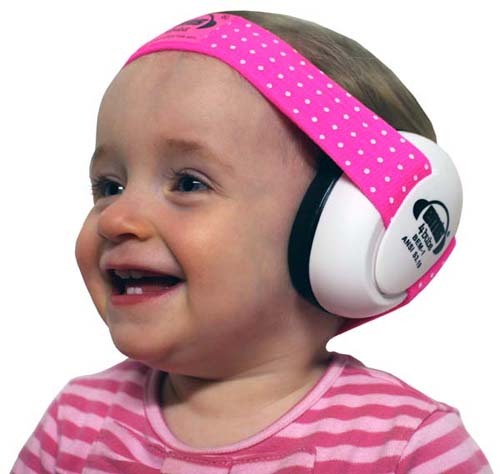 Em’s 4 Kids Baby Earmuffs are available for $29.95 plus post to anywhere in Australia from Earmuffs For Kids.